Book corner: Interview with author Matthew Harffy – History… the interesting bits! Earlier this week I had the opportunity to ask author Matthew Harffy a few questions. 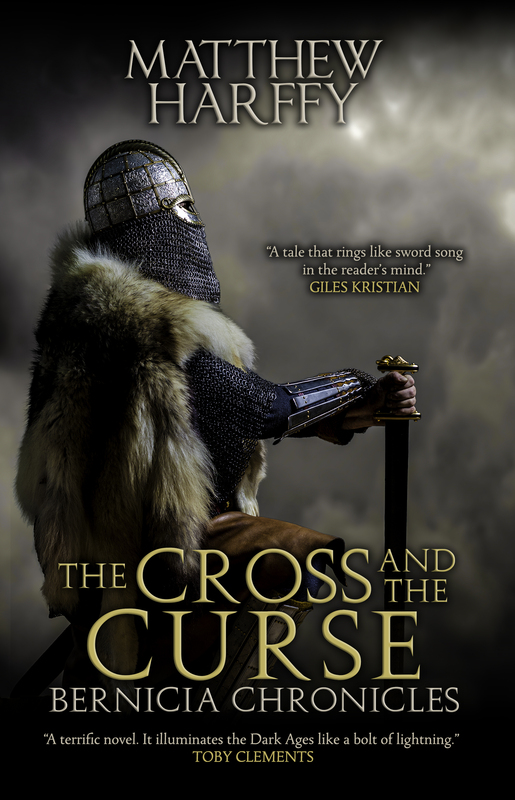 Matthew’s latest book in his Bernicia Chronicles series, The Cross and the Curse, is out today. If it’s anything like his debut novel, The Serpent Sword, it will be a real page-turner. The Romans are gone and largely forgotten, and the idea of a united England is 200 years in the future. 7th century England is a time of small, disparate kingdoms fighting for supremacy, a time when a skilled warrior can make a name for himself. The Bernicia chronicles follow Beobrand, a young warrior, barely out of childhood, trying to find his own place in the world. Beobrand finds enemies, adventure and friendship while learning to fight and overcome his own personal losses. And amidst all this he is searching for his brother’s killer and vengeance. 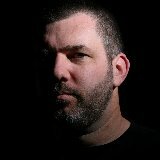 Matthew was kind enough to answer my queries, about his books, writing in general and it’s highs and lows. 1. What made you start writing? I’ve always been creative and been involved in different artistic projects. I’ve sung in bands, painted and drawn, and studied performing arts. Being an avid reader, writing was an obvious thing to try at some stage. I started writing stories many times over the years but I always quickly ran out of patience and/or inspiration. The Serpent Sword was the first story I ever finished writing. 2. Who are your major writing influences? There are so many, but a few of my favourite authors are David Gemmell, Bernard Cornwell, Larry McMurtry and Patrick O’Brian. More recently I’ve discovered lots of new authors, including Justin Hill and Robert Lautner, both of whom have produced excellent novels that inspired me. 3. What first got you interested in writing historical fiction? I used to read a lot of fantasy and also played fantasy role playing games, such as Dungeons & Dragons. When I started writing The Serpent Sword, historical fiction just seemed a better fit. The early medieval period gave me a heroic age where people believed in gods, monsters and magic, but it was firmly grounded in historical fact. It felt more grown up perhaps. I also read some best-sellers in the genre and thought – “I could do that”! 4. What attracted you to writing about the 7th century? It was more the area of Northumbria than the era at first. I lived in Northumberland as a child for a few years and loved the place, with its castles perched atop rocky cliffs overlooking the slate-grey North Sea. In 2001 I saw a documentary on TV about 7th century Anglo-Saxon graves being excavated at Bamburgh Castle. Something clicked and I started writing that night. After that I did research and realised what an interesting and important period the 7th century was for Northumbria and Britain as a whole. 5. What comes first, the storyline or the research? When starting a new project, I do some background reading and find some interesting historical events that I think I could plot a story around. I then work out how to get my characters’ lives to intertwine with the real events. 6. Which do you find easiest to develop, the plot or the characters? I think the plot is easier to develop. It is just like a jigsaw puzzle and you need to move the pieces until they click into place. The character develop a little bit haphazardly as the plot progresses. The plot drives the narration for me, and the characters develop within that framework. 7. What made you choose your central characters? From where do you get the inspiration for them? I honestly have no idea for most of them! I need a character to fit the plot so just start writing and then, as time progresses, they get richer and more detailed. Sometimes I need to go back and add details earlier on in the storylines where I wrote them with less complexity than they ended up with. Some writers know all about their characters before they write a word. I don’t! One character in The Cross and the Curse, Anhaga, appeared as a “walk on” part, just a person for a major character to interact with in one scene. But then, something happened and he became one of the most important characters in the novel! 8. Who do you think is your best character? Who is your personal favourite? And why? Wow – how can I answer that? I like them all, of course! Beobrand is the protagonist, so I probably know most about him and he is in most scenes of the novels. However, it is often more fun to write some of the less central characters. I particularly like the more recent character of Reaghan, who does not appear in The Serpent Sword. I’m not sure why, but writing the female characters is pretty fun. I am married and have two daughters, so I find it cathartic to put myself in their heads for a time and try to see the world through a woman’s eyes. 9. Do you know how the book is going to end when you start it? Broadly speaking yes. Perhaps not when I write the first lines of the book, but before I get too far into the narrative, I break down the plot into chapters and each chapter into scenes. I stick roughly to this structure and I write from beginning to end, without skipping any sections. So I write in the same order that the reader will read it. Of course, I know where it is headed, but I think this helps me get a feel for how the story plays out. 10. How do you approach your writing day? I don’t have a “writing day”! I have “writing hours”. These are one or two hour slots of time that I can dedicate to writing. In those moments, wherever I am, be it a coffee shop, the library, a train, a hotel room, a bench in a hall while my daughter practices Taekwondo, a plane, or my parked car (all places I have written), I put headphones on, read the last scene I wrote to get in the mood and then write as much as I can. I normally write about five or six hundred words in an hour. Something like that. Once I have finished the whole novel draft, then, and only then, do I read the whole book. 11. If Ridley Scott was to approach you to make a film of your books, who would you want to play Beobrand? From all I’ve heard of Hollywood, I’d have no say in the matter (Tom Cruise as Jack Reacher, anyone?!). I would like it to be someone who was large enough and strong enough to be believable, but with a brooding intensity and presence that would draw others to his side. Perhaps your readers could suggest some actors in the comments! 12. Have you ever changed your mind about killing off a character? No. They die when their time is up! It is as simple as that. I don’t really choose for them to be killed, it is just what the story demands. 13. What comes next? Do you have more books planned in the Bernicia Chronicles? Yes! The follow up to The Serpent Sword – The Cross and the Curse – will be published on 22nd January 2016. Book three of the Bernicia Chronicles, By Blood and Blade, is already written and is due for release later this year. I am currently working on a novella, a standalone prequel to the Bernicia Chronicles, called Kin of Cain. That should be published this year too. Then I’ll move on to book four of the Bernicia Chronicles (as yet untitled). That should be ready in 2017. I have plenty more stories to tell, so if people keep buying them, I’ll keep writing them! 14. Which other periods of history would you like to write about? I’m interesting in many periods, but the 19th century is a time I would most like to write about. Perhaps set in the American West, as I love westerns. 15. What is the best thing about writing? And what’s the worst? The best thing about writing is getting to tell stories and find that others actually enjoy them! Hearing from readers is the best thing, and reviews on Amazon and other sites actually help sell more books, so that’s an added bonus! The worst thing is that it takes so bloody long to write a book! And by definition all of that time is spent on your own with no feedback, so you have to trust that you are writing something that others will want to read. Thank you for the great questions and for the opportunity to spend some time with you today on your awesome blog. Thank you very much to Matthew Harffy for taking the time to answer my questions. The Serpent Sword is already available now and well worth the read. It’s a wonderful novel, full of excitement and adventure. The Cross and the Curse is available from Friday 22nd January 2016. To find out more about Matthew Harffy you can his Facebook and Twitter pages, and his own website. Click on the book titles to buy The Serpent Sword and The Cross and The Curse. I’d like to extend a huge thank you to Matthew for such a wonderful interview and wish him every success with his new novel. really looking forward to this series, as soon as I get through Michael Jecks Knights Templar series I’ll be going back in time to do these. Great interview. Great interview. I’m a big fan of the Serpent Sword. Nice to get to know more about Matthew. 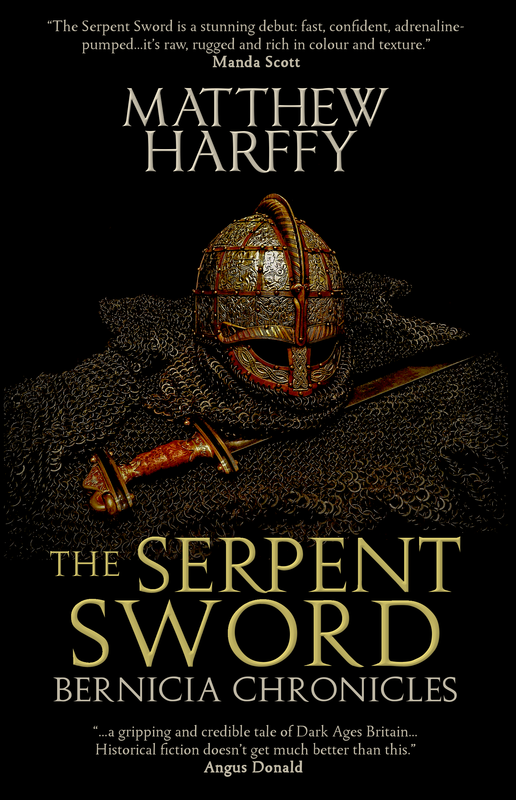 Pingback: Book Corner: The Serpent Sword by Matthew Harffy – History… the interesting bits! Pingback: Book Corner: The Blood and the Blade by Matthew Harffy – History… the interesting bits! Pingback: Book Corner: Kin of Cain by Matthew Harffy – History… the interesting bits! Pingback: Book Corner: Sharon talks to Matthew Harffy – History… the interesting bits! Pingback: Book Corner: Warrior of Woden – History… the interesting bits!